The Income Tax Return (ITR) filing season is here and the last date to file ITR for FY 2017-18 is 31st July 2018. For a better experience, download our Android App or IOS App. Every Taxpayer who has tax liability must pay taxes and file income tax return for the same. In order to file tax return it is mandatory for the taxpayer to register on the Income Tax Department’s official e- filing portal. Step: 1 Visit the Income Tax Department’s official e-filing portal, on the homepage click on the option that says“Register Yourself”. Step: 2 Select the User Type, once you click on the Register Yourself button, you will be redirected to a form that will ask you to select your use type. After correctly entering all the details, click on the submit button. Step: 5 Verification: Once you submit the above-mentioned form, a 6-digit One Time Password (OTP) will be sent to your registered mobile number and the email ID. Enter this OTP correctly, in order to verify the details. If you are a non-resident the OTP will be sent to your registered email address. The OTP will expire after 24 hours from the actual time of receipt. In case, one fails to complete the registration process within the given 24 hours, the entire registration must be initiated again. How to login to the Income Tax Department’s official portal? 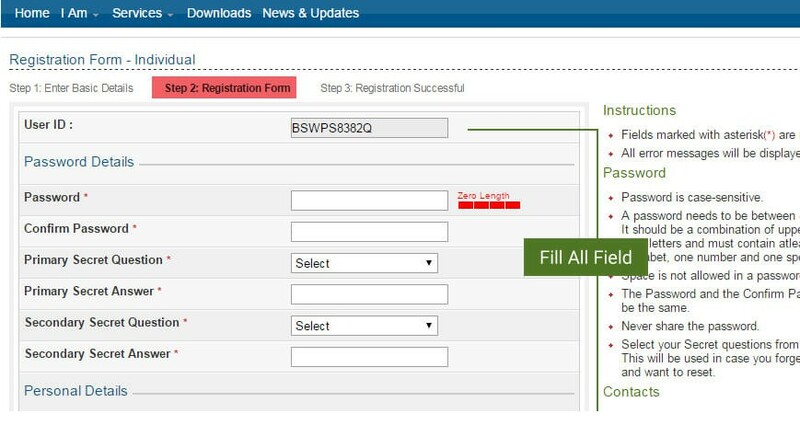 Step: 1 Visit the Income Tax Department’s e-filing portal, there you will find a button that says “Login Here”, all the registered users are supposed to click on this button to login. Step: 2 Once you click on the “Login here” button, you will be redirected to the income tax filing login page, where you are supposed to enter your income tax login username and password. NOTE: For Income Tax Return Filing, the User ID is your PAN Card Number. You can file ITR without the hassle of registering with IT Department, just E-file ITR with All India ITR without any hassle. Q. What does Income Return mean? An Income Return is a specified form containing details of income earned by a taxpayer in a financial year and the taxes paid upon the income to the Income Tax Department. There are different Income tax return forms, a selection of which are filed depending upon the status and nature of the claims. Q. From where can one obtain Income an Tax Return form? The Income Tax Return forms can be downloaded from the official website of the Income Tax Department of India. To learn more click here. You can also try this page if you have a Form 16. Q. What are the different ways of filing Income Tax Returns? By furnishing the returns in a hardcopy of the form. By furnishing the returns electronically, using a Digital Signature. By transferring the data electronically via an Electronic Verification Code. By filing for returns electronically and then submitting the verification of the return in Income Tax Returns Form ITR-V.
Q. What are the other documents required while filing Income Tax Returns? While filing for Income Tax Returns no other documents are required. But verification documents will be required during assessments and inquiry which is why it is advisable that a taxpayer must maintain these documents and be able to produce them when required. If you have paid taxes on your own you may be asked to confirm this with the Challan Identification Number (CIN). This is the number you receive from a designated bank when you pay your taxes either offline or online at the tin nsdl portal. What do you understand by Income Tax?